Ah, the melancholy gaze of a bench player, forever playing games of pepper and hitting fungoes to outfield starters. I bet if George could undo that top shirt button, all his ennui would escape like helium from a balloon. Mr. Stumpf played 19 pro seasons, with 14 of them coming at the AA level. 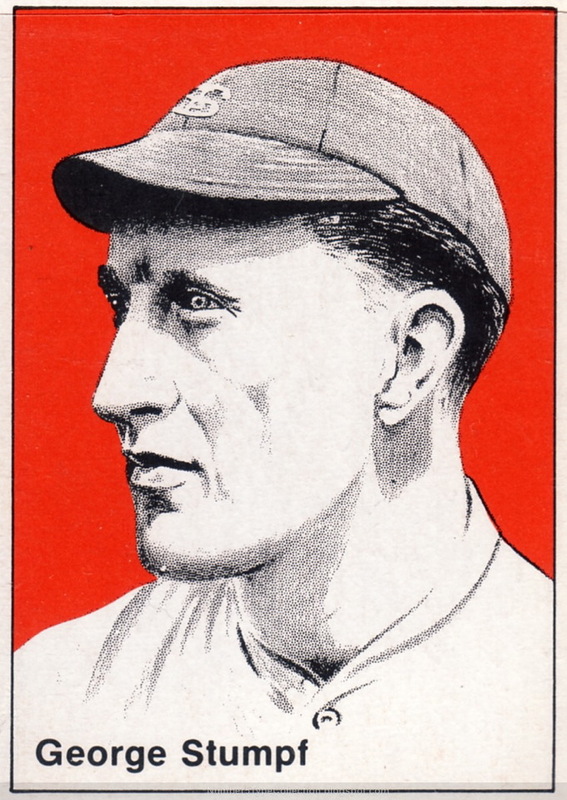 He made spot appearances for the Red Sox in 3 seasons, maxing out at 79 games in 1932. George hit his only big league homer at Fenway Park on August 24. For those who like their ballplayers happy, this History of the St. Paul Saints page caught George in a lighter moment. This 21-card set features stories of minor leaguers who suited up in Minnesota between the 30s and 50s. Olde Cards (the company) marked it as 1976, but the Twins actually offered it by mail order during the 1978 season. Five HOFers made the checklist: Ted Williams, Willie Mays, Hoyt Wilhelm, Roy Campanella, and Ray Dandridge. 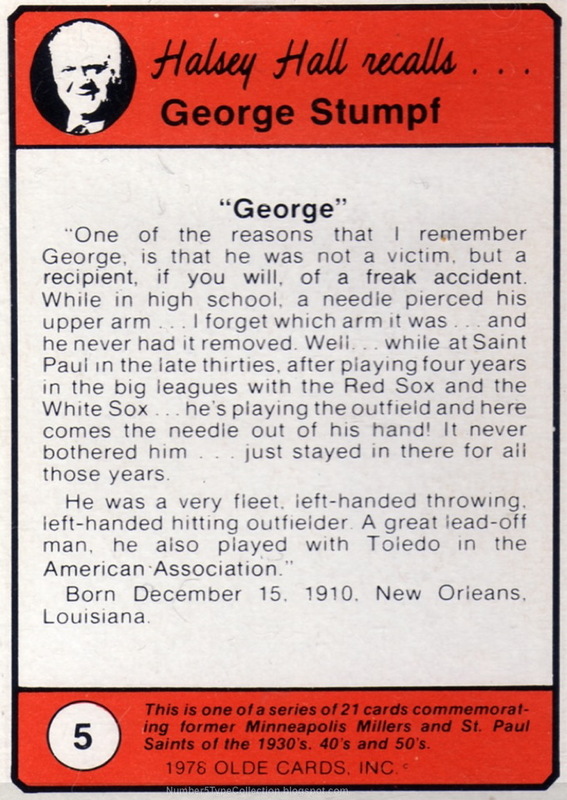 The other cards show 15 lesser-known players (like George) and a self-portrait of the set's illustrator. I'm glad to read a story about a ballplayer and arm needles that doesn't result in testimony before Congress. 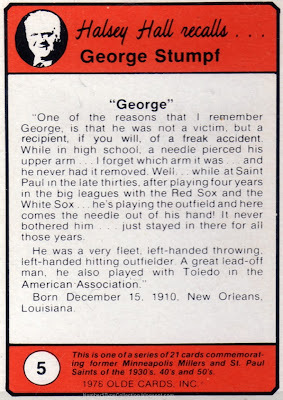 Value: George cost $3 on Beckett Marketplace, about right for 1970s oddball singles. Fakes / reprints: Very few folks have even seen this set, let alone wanted it enough to make faking it worthwhile. I was looking for price on some of my not so known sets of cards, and came across this site. I have a set of 45 cards, and can't find any other information of them. Any help would be appreciated. eBay's your best bet to find a "market value" for cards, even for sets as obscure as this one. For example, there are three listings for "Olde Cards" right now.